Growing to perfection, a wild iris blossoms in a field at the Cape St. Mary's Ecological Reserve on the Avalon Peninsula in Newfoundland, Canada. A field at the Cape St. Mary's Ecological Reserve on the Avalon Peninsula in Newfoundland, Canada blossoms in purple hues from the Iris flowers growing wild. The sunlight beats down on the field at the top of the high cliffs where these wild Iris flowers flourish. Home to gannets, kittiwakes, common murres, thick-billed murres, razorbills, black guillemots, cormorants and many other types of seabird colonies, the Cape St. Mary's Ecological Reserve is protected by the Provincial Park System and many of the wild flowers which grow in these fields are also protected. The sub-Arctic tundra surrounding the Cape St. Mary's Ecological Reserve provides the ideal soil type for the Iris flowers to blossom to their fullest. 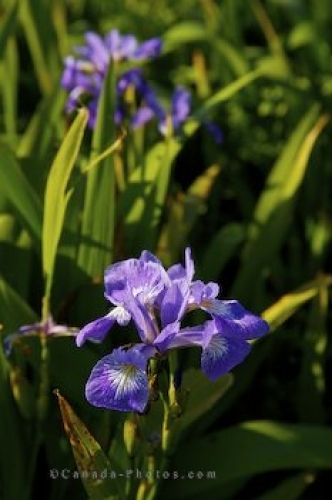 When in full bloom, the wild Iris is a showy type of plant with its fan like flowerhead and vibrant colors. Picture of a wild Iris in a field at the Cape St. Mary's Ecological Reserve, Newfoundland. Wild Iris flowers growing in the field at the Cape St Mary's Ecological Reserve, Cape St Mary's, also known as The Cape, Highway 100, The Cape Shore, Placentia Bay, Avalon Peninsula, Newfoundland, Newfoundland Labrador, Canada.